Tableware that becomes an extension of our senses? I thought I would share this article about a South Korean designer who has harnessed the phenomenon of Synesthesia to enhance dining pleasure. Her unique tableware designs changed the way people experienced food, with less focus on etiquette and focus on the physical and sensual experience of the food. The added texture, weight and balance of these utensils make for a unexpected and fun experience. The way “people eat changed dramatically, from being “proper”, adhering to conventional table manners, to being more childlike as they clearly have fun, emitting more sounds and laughing more often. 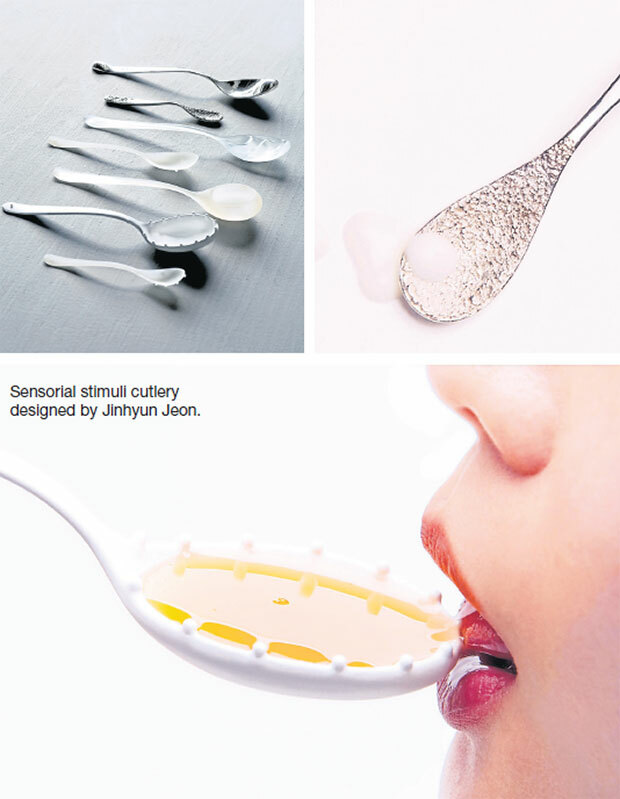 Her “Tableware as Sensorial Stimuli” has been nominated for product awards and she is already working on her next project regarding enhancing the dining experience using sound! Watch the full video here: Tableware as Sensorial Stimuli from Jinhyun Jeon on Vimeo. You can read more articles about her inventions and where she is headed next here: Tasting the Rainbow, Tableware as Sensorial Stimuli.